It’s a remarkable idea and a remarkable film. I haven’t been able to stop thinking about it for weeks. Vanya on 42nd Street is by Louis Malle and stars Andre Gregory and Wallace Shawn. They’re the same dynamic trio who conceived My Dinner With Andre, one of the most audacious films ever made. Vanya on 42nd Street started when theater director Andre Gregory decided he wanted to rehearsal a recently-translated version of Chekhov’s play Uncle Vanya. Rehearse it. He didn’t want to do anything else. There was to be no performance. The whole idea was the rehearsal. 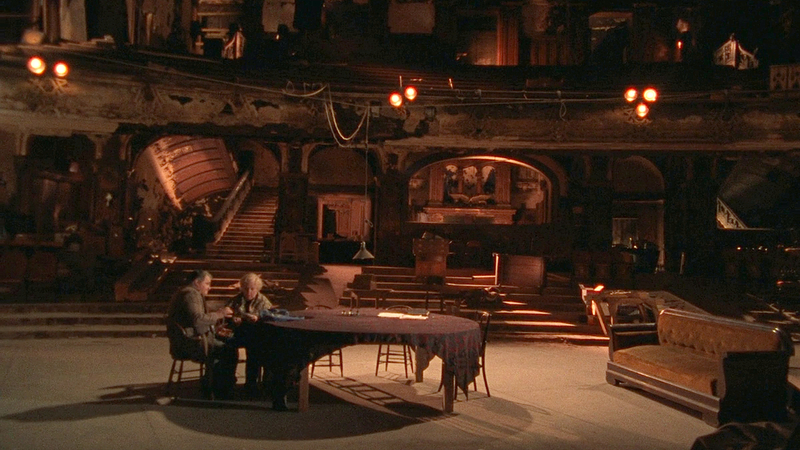 They started in a loft, but quickly moved to an abandoned theater on 42nd Street. And I mean abandoned. It was a crumbling shell, with rats scurrying about. I understand the stench of urine was fairly intense. This was their workspace. I doubt OSHA would approve. They rehearsed Chekhov’s play just to get familiar with it. To become truly intimate. A few cast members, such as Julianne Moore, whose star was just starting to rise at the time, said they resented all this work at first for something that would not be put on. Later they said they resented it when Gregory decided to in fact let some people in. Each cast member could bring “two loved ones” per show. That amounted to about 20 people, give or take. Still, for the next three and a half years, on and off but mostly on, they rehearsed this work—to what end? To no end. Or rather, that was the end. It became a massed catharsis for the actors, who did it differently each time, exploring new possibilities. There was no blocking. Few props. They wore their street clothes. One of Gregory’s points with the experiment was that with great literature, props and sets and effects are almost unnecessary. Finally Louis Malle, the great French filmmaker, decided he wanted to record these rehearsals for posterity. This presented some problems, in that for the purpose of the film the play had to be staged exactly the same way each time for cutting purposes. So in a way we’re not seeing a filmed rehearsal. We’re seeing a simulation of a filmed rehearsal, which itself isn’t the play but an imagining of the play. So it’s a simulation of a conception of one potential actuality. Head spinning yet? The film is remarkable in that, like My Dinner With Andre, it can spark so much imagery in the head of the viewer even while it itself just points a camera at actors talking to one another against generally uninteresting backgrounds. But were it not for the film, almost no one would know this little experiment had ever happened. And as I said, since they constantly kept changing things, only one conception was immortalized on celluloid. It got me thinking, though, about whether it’s okay to just do art for yourself and not share it. I’ve been considering an urge lately not to publish—through a publisher or on my own—Entertaining Welsey Shaw. I wrote it for specific reasons, those reasons have been realized, and maybe I should just move on. Did I write it for you or me? But what made it more interesting was that a few days later, I watched another film, Krzysztof Kieślowski’s Blue, the first part of his so-called Three Colors trilogy. In this film a woman who has suffered a terrible loss decides to cut herself off from the world and live without any emotional engagement. And the film argues that ultimately you can’t. You have to interact. You have to dance with them that brung you. Julie, played with amazing reserve and pin-point precision by Juliette Binoche, realizes this in the end, even though no words are spoken. Both these films have been in my mind a lot since I saw them. Gregory comes down on the side of isolation. A while ago I started submitting Welsey Shaw to agents. Not surprisingly it’s a tough haul. I was thinking of just forgetting the whole thing. Even going through the trouble of self-pub and the related promotion seems like too much work. What does that have to do with writing? Or why I wanted to write Welsey Shaw in the first place? But then there’s another part of me that is also at work on a sequel. So part of me wants to continue with a “franchise” that nobody wants so far in the first place, and another part of me wants to just tuck it all away like Andre Gregory did with Uncle Vanya. As I said, no easy answer. Maybe I’ll watch both movies again… That’s it. This entry was posted on May 1, 2015 by John Grabowski. It was filed under Blog, Entertaining Welsey Shaw and was tagged with Andre Gregory, Anton Chekhov, art, Blue, Entertaining Welsey Shaw, fiction, John Grabowski, Krzysztof Kieślowski, literature, Louis Malle, Three Colors Trilogy, Vanya on 42nd Street, Wallace Shawn, writing. I loved the movie, Blue, (actually the whole trilogy) and thought Juliette Binoche was exquisite in it. I’m flattered that you think 100 autographed copies of my novel would be of value…to anybody. It’s interesting, however, to note—not that I’m comparing anything I’ve written to hers—that the first editions of Virginia Woolf’s books numbered only in the hundreds, and were published by the “small press” her husband had set up. The world at large hardly took notice. Of course today those first editions are worth a pretty penny…Wish I had one.